In this post, you will learn how to use a new service from Amazon to send notifications to your users on iOS and Android devices. Amazon SNS (Amazon Simple Notification Services) is a notification service used to send the notifications to the subscribed endpoint or devices. It is provided as a part of Amazon Web Services. It provides a low-cost infrastructure for the mass delivery of messages, emails, notifications, etc. Create topic - you will get the Topic ARN for which you have to send the notification or send the messages. Create Application - after this, you have to create an application whether you want to send the notification over the Android application or over the iOS application. Create Endpoint - you need to create the endpoint and subscribe to that endpoint on which you have to publish the message or send the notification. Publish Message - the last step is to publish the message or send the notification to the endpoint. You can follow the same process for using this notification service over the Amazon Console too. You need to login to the console first. After that, you will see a screen like this. Type "Simple Notification Service" in the textbox and select from the results shown on the screen. Here, you will have the list of topics, subscriptions, applications, and endpoints that you create. In the above screenshot, I have created two endpoints - one for Android devices (GSM) and the other one is for iOS devices (APNS). For using the ASNS from the console, the steps are the same as described above. 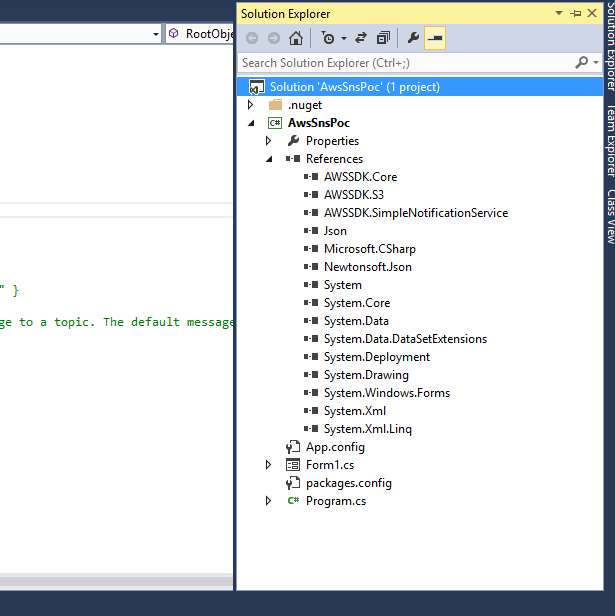 I am going to show a working example of the ASNS in .NET using Visual Studio. 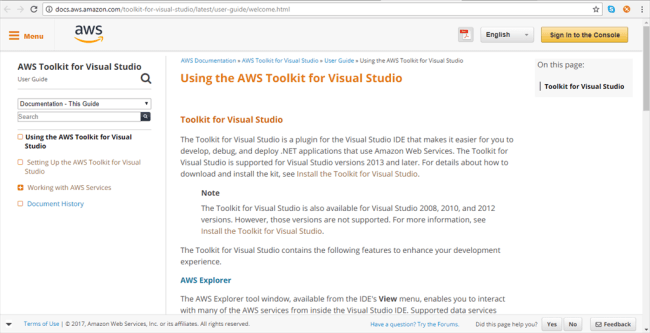 Install AWS Toolkit for Visual Studio. Create a Windows or web application; whichever you prefer. I have created a Windows.Form application and have made two radio buttons and one submit button to send notifications. After this, you need to setup your project to use the Amazon Services. First, you have to specify the Access Key, Secret Key, and Region in web.config file in case you are using the web application, and in app.config if you are using the Windows application. After this, you need to install a few of the necessary .dll files from the NuGet Package Manager. You can add these required libraries from the NuGet Package Manager or PM> console by typing the name of the libraries, as shown in the references. Now, it's time to write a few lines of code for this functionality. AttributeValue = "SNS Test AttrValue"
Protocol = "application", // important to chose the protocol as I am sending notification to applications I have chosen application here. //NOTE : One of the most important thing that you need to take care of that is you have to be very careful while forming the Object of the JSON request that you want to send like as I have given the JSON and the Object formation of that too. If you get the message, "Notification sent successfully," you have successfully integrated this SNS Service into your application. For live testing on your devices, you must be ready with your device (iOS/Android) on which you are going to test this. I hope, you will enjoy implementing this awesome service from Amazon. If you have any queries or questions, I will be happy to give the solution.